"Sun, sea, sand”, the three words instantaneously associated with Sanya. Sanya is, of course, the number one tourist destination in China during the sizzling summer months, and with so many top class resorts, restaurants and entertainment, fine sandy beaches, breath-taking scenery and azure skies, is it really any wonder that every year millions of tourists flock to this southern coastal city in Hainan? If you’re dreaming about golden beaches, luscious palm trees and turquoise water gently lapping on the shore, but don’t want to leave the Mainland, then Sanya is definitely your best, albeit most expensive, option. But hey, summer only rolls around once a year so dig out those flip-flops and swim gear and start planning your China beach summer. Here’s a quick guide to Sanya’s main beaches. They say Sanya Bay is the best location to watch the sunset. In fact, it is said that this is the only place where you can catch glimpses of the sunset over the sea in the area. 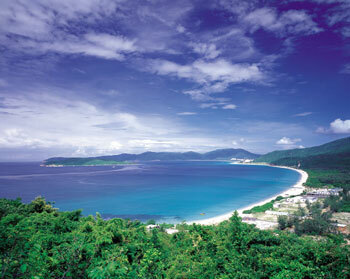 Located 8km west of Sanya’s suburbs, the bay stretches along the coast in a crescent shape for 22 kilometres. It’s not considered the best or most popular beach in Sanya however, as its waters and sand are known to get quite muddy. As with all developed beaches, a jungle of hotels and apartment blocks run the length of the beach. On the up side, a wide range of fun activities are on offer at Sanya Bay, such as wind surfing and sailing, but overall the biggest attraction is the opportunity to stroll along the beach and watch the sunset. This long, crescent-shaped bay runs 7.5 kilometres along the sea and is considered one of the best beaches in the Sanya area. Famous for its white sands and blue waters, the bay is home to coral reefs, tropical fish and lots of other fascinating multi-coloured marine life. The water is usually crystal clear which makes it an ideal spot for snorkelling or scuba diving. In recent years, a number of high-end resorts, hotels, deluxe villas and the like have settled here. While there are advantages to this development, many tourists do complain that prices are too steep here however – so be warned! 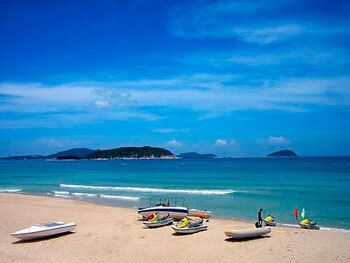 One of the most popular beaches in Hainan Island, Dadonghai is located 3km south east of downtown Sanya. Its white sand and green trees stretch for 2.3 km in a crescent shape. 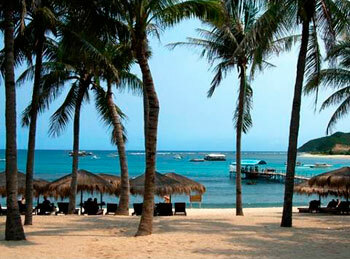 Dadonghai is most famous for its blue waters, white sands, green trees and water sports. Diving, underwater photography, ocean fishing, beach sports, sailing and speedboat trips are all on offer here. Shops, restaurants and amusement facilities are within easy reach of the beach. Besides Dadonghai’s natural beauty, another major factor contributing to the beach’s popularity is the fact that it is the closest bay from Sanya City, therefore easy and convenient to get to by bus or taxi.